Designed to be played with friends or a date, Meteor Night shows a peaceful sky full of 8-bit stars. Sometimes a meteor will fly across the sky. Turn down the lights, bring a blanket and snacks, and enjoy Meteor Night together. 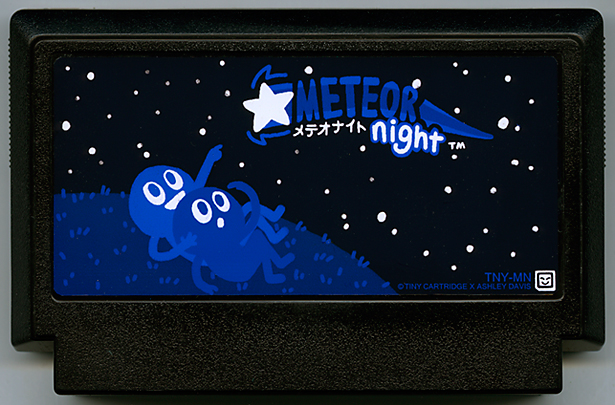 A game based on the Famicase "Meteor Night" for the "Chill"-themed A Game By Its Cover jam 2018. Press C on the title screen to toggle between Chill mode and Chill Out mode. Music: "Arpument" from 9 Songs in PICO-8 by Robby Duguay, used under CC BY-NC-SA 4.0. Website background image: "Summer Starry Sky" by jyryk58, used under CC BY 2.0 (desaturated from original).